Ready or not, snow season is on its way and you know what that means: dusting off those boots, bindings, boards and skis, and shredding the slopes! Whether you’re a beginner or an avid snow skier or snowboarder, there’s a good chance it’s been nearly a year since you last hit the slopes. What about staying active outside of the slopes? Get yourself ski and snowboard-ready before you lace up those snow boots to avoid the aches and pains of a post-first ski and snowboard weekend. 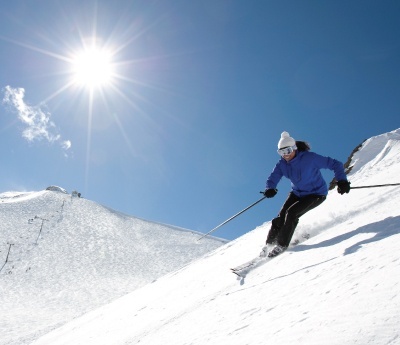 With these helpful guidelines, you’ll be able to target your aerobic endurance and anaerobic cardio, as well as strengthen your muscles to be fit and ready for a safe, action-packed ski and snowboard season. Zumba – With classic Zumba-style movements, core stabilization training and constant cardio exertion, these classes will help strengthen your frontal plane, improve balance and help avoid potential knee injury. Boot Camp or Sports Conditioning – Join these heart-pumping, fat-burning classes for a full body workout with a sports-oriented approach. Pilates or Yoga – Burn calories and challenge your inner strength and flexibility with these low-impact classes. Strength and Interval Training – Combine the workout benefits of the weight floor with the motivation and positive atmosphere of a group fitness class to help you sculpt a lean, strong body. Indoor Cycling and Aqua – Jump on a bike or into the pool for a full body workout that will improve your strength and stamina, guaranteed. Single leg lateral hops: Build explosive strength in the frontal plane (think moving side-to-side). Whether turning right or left on the slopes, one leg is dominate and this exercise mimics that as all of the body weight is moved by one leg at a time. These can be done for time to build endurance or be loaded (add weights like holding a medicine ball or wearing a weighted vest) for power. Rotational planks: Build core strength and stability by holding the plank for time while also building adaptation to the lower body twisting and turning on the slopes. Add light dumbbells in each hand to challenge yourself once your own body weight becomes easy. Multi-directional box jumps: Using a smaller plyometric box alternate jumping forward, backward and left to right, on and off of the box. Progress to jumping over the box itself, in every direction, once you are used to this movement. It’s important to do this exercise with your feet closer together than normal to help mimic the distance they would be in ski boots. Single leg squat cable row: This is a simple cable pull exercise, but with only one leg planted on the floor, while you bring the other knee up past waist height when the pulling motion is in full contraction. Alternate sides and which leg is planted on both the grip side and opposite from the grip (Pull with left hand while left foot is planted, then with only the right foot planted). Do this exercise with a rope handle to increase grip strength. This will not only work lower body and back, but will also fire up that core to keep you stable on the slopes. Fitness is one part of the puzzle, but let’s not forget about your food intake. It’s just as important to maintain a healthy diet for your overall wellbeing. Stick to a plan, based on consuming foods that are as close to their natural state as possible, for a balanced nutrition regimen. Think: lean meats and eggs, fruits and veggies, whole grains, and delicious healthy fats like avocado and nuts. Following these fundamental guidelines to your fitness routine will help to ensure a healthy and fun ski and snowboard season, avoiding unwanted aches and, hopefully, unnecessary injuries along the way.